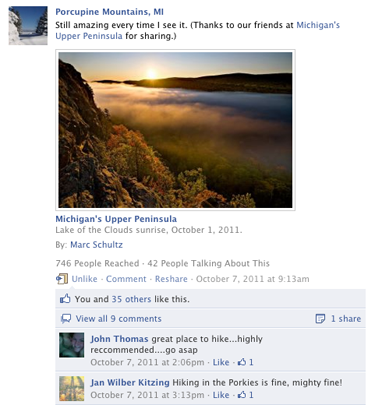 The popular Porcupine Mountains Facebook page uses the visual splendor of the destination to engage and grow its fan base. Pilch & Barnet shares images from our photo library and encourages fans to share their own pictures of the region’s scenery. Do you like Pinterest but wish it had more mustaches? Then check out Gentlemint, which boasts a “a mint of manly things.” And hey, it’s even endorsed by the American Mustache Institute! Facebook’s launch of Open Graph could mean “a new era in social networking,” Shoutlet said earlier this week. Speaking of Facebook, it turns out pages shouldn’t post more than once every three hours, according to a recent study. Thanks for reading, everybody. Have a great weekend! If it seems like everybody and their mother is on Facebook these days, that’s probably because they are – as well as their brother, sister, cousin and first-grade teacher, too. With more than 800 million active users, Facebook is becoming a huge part of marketing plans for businesses of all sizes – from Fortune 500 companies to mom-and-pop corner stores. But while setting up your business’ Facebook page is easy and free, one of the advantages of using Facebook promote your business is its unique and inexpensive advertising. Recent studies have shown that Facebook ads tend to be more engaging than ads on other websites. And the social aspect of Facebook – seeing that your friend likes a business or a product – can be a huge boon to advertisers. For instance, IBM Interactive Marketing says 51 percent of fans of a Facebook brand page are more likely to purchase from that brand, and 60 percent of those fans are more likely to recommend the brand to others. Facebook provides a good overview and guide to using Facebook ads, and there are plenty of other useful resources online outlining best practices to help you run a successful Facebook ad campaign. Run a variety of ads. Facebook allows you to experiment with different types of ads, so take advantage of that. Experiment with Page Like ads (“Bill Smith likes Brand X”), Page Post ads (highlighting a timely or creative Wall post) or more traditional ads to see which one attracts the biggest audience. Monitor your ads’ performance. Is one type of ad performing better than another? Set a threshold for your ads – click-through rate (the percentage of fans who interacted with your ad), reaching a certain number of fans or some other metric – and check back on it frequently. You can also look at your Page Insights to target ads to your page’s key demographics. Keep your content creative. If you’re running a traditional ad, make sure you include eye-catching content. You’re trying to get people interested in your page, so use phrases that call people to action (For example, “Click here!” or “Book your flight today!”) Images attract people, but make sure your images are relevant to what you’re advertising. In destination marketing, the term “shoulder season” stands for those times of the year when nobody seems to want to travel. Occupancy rates are down at lodging establishments, restaurants are below capacity, attendance at attractions is down and retailers see fewer customers walk through their doors. In many places in the northern United States, winter is the shoulder season. In Wisconsin, the post holiday shopping phase of winter is the ultimate shoulder season. And springtime in Wisconsin, with its unpredictable weather, can also be excruciatingly slow for the state’s travel industry. Create an event. Mid-winter festivals, open houses, trunk shows, live entertainment—nearly any out-of-the-ordinary happening can be used to drum up business during the long winter months. Though it’s hard to lure people out of their warm homes, there is such a thing as cabin fever. Give people exciting reasons to travel, promote it properly and you’re on your way to injecting some warmth into frozen winter sales numbers. Be big and bold with your sales pitch. Winter is no time to be a shrinking violet. Use big signage and bold sales language. Big, Big, BIG and hot, hot, HOT is what we’re talking about. It takes a bit more muscle to move consumers during the mid-winter months. Valentine’s Day and Saint Patrick’s Day. Face it—winter can be very long in Wisconsin. You need to use any excuse possible to create some excitement and interest. Mid-winter holidays like Valentine’s Day and St. Patrick’s Day—or any holiday, real or made up—can serve as the basis for some type of promotion. Overnight packages. During late winter and early spring, travelers in Wisconsin tend to be short-term planners. Offering overnight packages or other special package deals can entice these last-minute trip takers. Cross-promote and partner. Work with other businesses and local allies to help one another increase customers. Strategic partnerships between restaurants, lodging and retailers can help to boost everyone’s mid-winter sales numbers. Thoughtful action is the only way to counteract the inevitable shoulder seasons that come around each year. Make plans this year to have your best winter ever. Welcome to 2012, everybody! I hope you all get your affairs in order before December, when the Mayans say the world is going to end. I’ve read Cormac McCarthy’s “The Road” and seen “Waterworld,” so I’d like to think I’m pretty well prepared. Which brands have the highest quality relationships on Facebook? Not surprisingly, it tends to be the brands with the highest fan numbers, including YouTube and Coca-Cola. Do you run giveaways or promotions on Facebook? This list is a little basic, but a gives some good tips on how to pick a prize. Sorry about getting a little social media-heavy here, but here’s a rave review for Path, the uber-personal social network. Harry Potter travel posters? Yes, please. Another fun one: What can you fit in your 62,000-plus character limit in Facebook updates? A lot, as it turns out. That’s all from P&B this week. Have a great weekend, and we hope your 2012 has started out fabulously so far!